Vice President Joe Biden addresses the "Grassroots Event" held at Wright State University in Fairborn, Ohio on Wednesday afternoon. 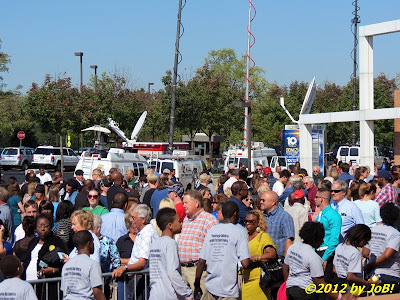 FAIRBORN, OH -- The Obama 2012 presidential campaign paid another visit to Ohio when Vice President Joe Biden addressed a "grassroots" gathering of several hundred enthusiastic supporters Wednesday afternoon at Wright State University, located just outside Dayton. Air Force Two arrived at Wright-Patterson Air Force Base just after 12PM, and he was greeted by a military delegation headed by General Janet Wolfenbarger, the Air Force's first four-star general and commander of the Air Force Material Command. 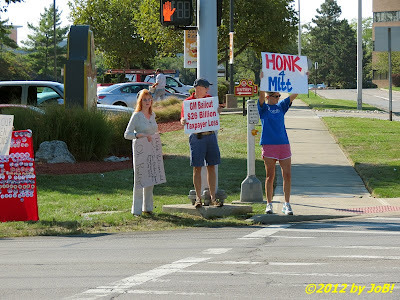 The vice president's motorcade made the short trip to the campus and passed several demonstrators expressing their dissatisfaction with the Obama administration from a location just across the street from the venue. Before coming into the main hall, Biden visited with folks who were in the event's overflow area to express his thanks for their turn-out for his appearance. A capacity crowd at Wright State University's Student Union listen to Vice President Biden's campaign remarks at the "Grassroots Event" on Wednesday afternoon. The vice president began his remarks on a somber note by addressing the death of ambassador Christopher Stevens and three other State Department personnel during an attack on the US consulate in Benghazi, Libya. Biden personally knew Stevens from their work on the Senate's Foreign Relations Committee and stated that "Chris and Sean and their colleagues were exemplars of our nation's commitment to freedom and to justice and to partnership with nations and people all around the world in order to make us safer at home." He vowed that their killers would be brought to justice and that "there is no place in the civilized world for senseless murder like it occurred last night." 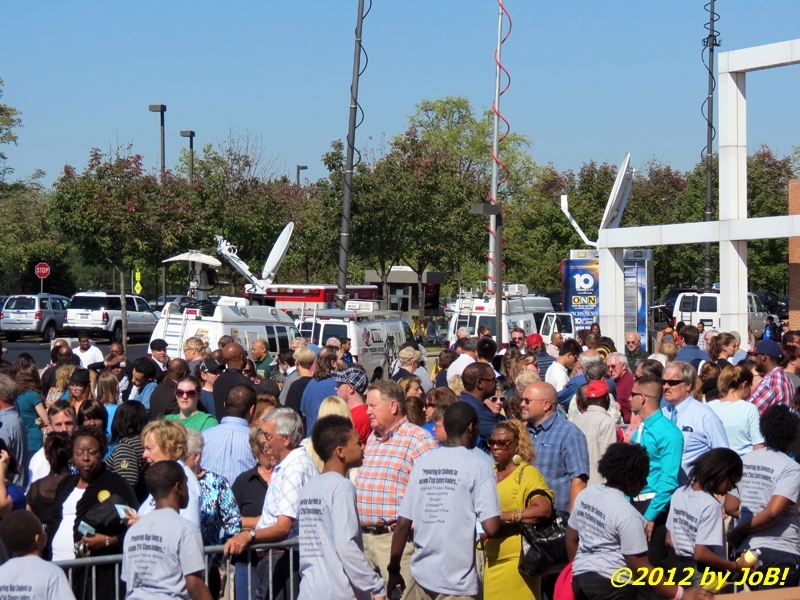 Several hundred people and multiple media outlets awaiting Vice President Biden's arrival at Wright State University for the "Grassroots Event" on Wednesday afternoon. Biden segued this recent foreign tragedy to the domestic election by highlighting the choice voters face in November and making the case for his running mate. Starting with jobs, the vice president went down a listing of issues where his party's vision and that of their opponents is starkly different. 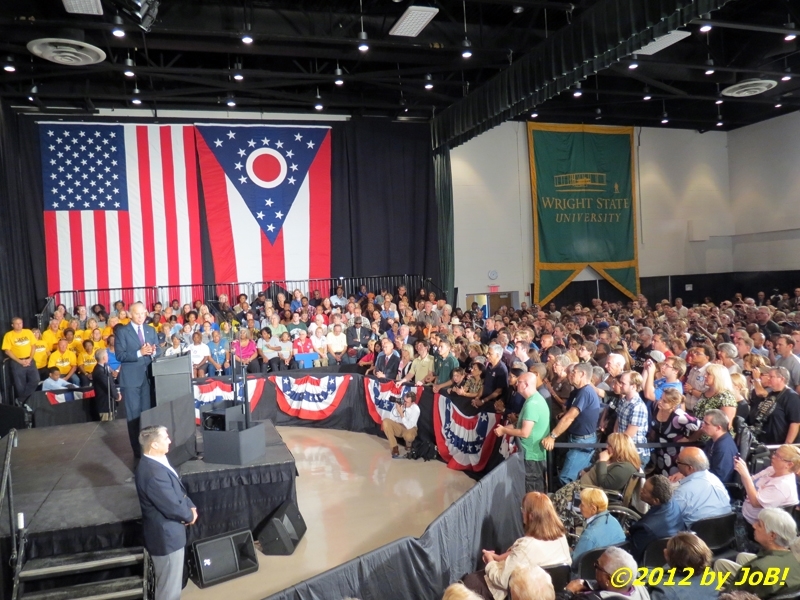 Speaking to an Ohio audience, he touted the Obama administration's bailout of the US automotive industry that directly impacts "115,000 decent paying auto jobs in Ohio that you can raise a family on" and that has helped reduce the state's unemployment rate to one well below the national average. 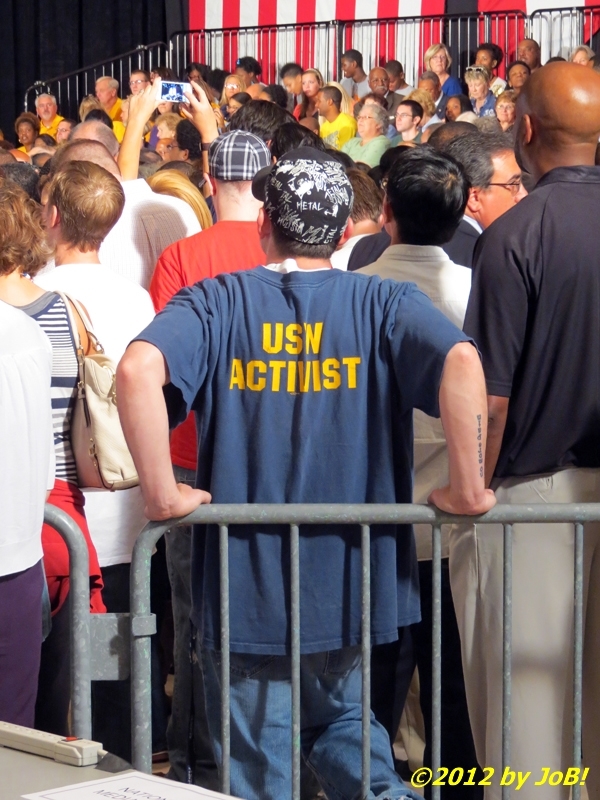 He stayed on the labor theme by touted the half-million manufacturing jobs that have been created since 2009 and the promise of another 500,000 by 2016 through their opposition to tax breaks for companies that move such jobs to overseas locations. One of the many union and labor supporters in attendance at the "Grassroots Event" at Wright State University on Wednesday afternoon. On the subject of taxes, Biden stated that he and the president have two requirements for any change to the existing code: it has to be "fair" and must "generate economic growth and expansion." The current rate system and proposals from the Romney/Ryan ticket, in the vice president's opinion, favor the richest 120,000 families in the country and do not meet those guidelines. He bought up the payroll tax decreases seen over the past three years that have "put more money in the pockets of middle-class people"--an average of $3,600 per family--and to put the focus of these breaks on those making less than $250,000 per year. 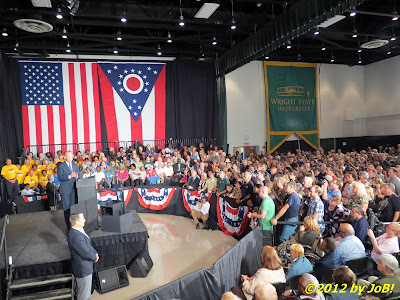 His mention of one such break, a $2,500 credit for families with college students, was greeted with warm applause but, unfortunately, the vice president--on two different occasions--referred to his host as "Wayne State University" instead of Wright State. He was politely corrected by the attendees and then used both schools (plus his own alma mater, the University of Delaware) to revert back to his prepared talking points. Vice President Biden emphasizing improved educational benefits to attendees at the "Grassroots Event" held at Wright State University on Wednesday afternoon. Medicare was next on the list and he presented the stark choices posed by the opposing campaigns: the present plan or "Vouchercare" as some describe how Paul Ryan's House budget plan will transform the current system. 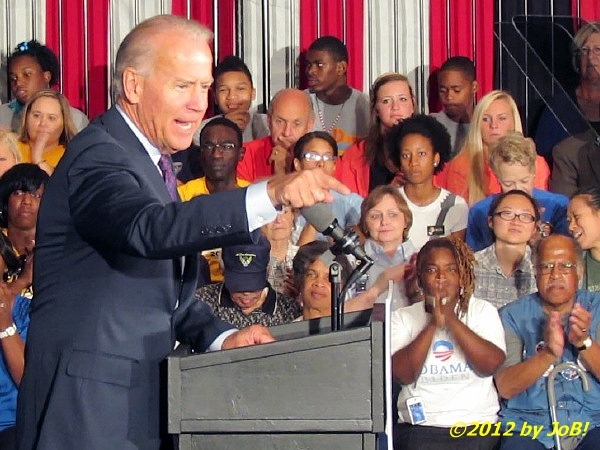 Biden touted the recent addition of Medicare preventive care benefits to 30 million recipients at no additional costs, saving them approximately $700 a year on previous out-of-pocket expenses. Countering their opponent's claims of cutting the program, the vice president reminded the gathering that benefits have been increased and the Obama administration has made Medicare solvent until 2024. Vice President Biden greeting well-wishers after making campaign remarks at the "Grassroots Event" held at Wright State University on Wednesday afternoon. 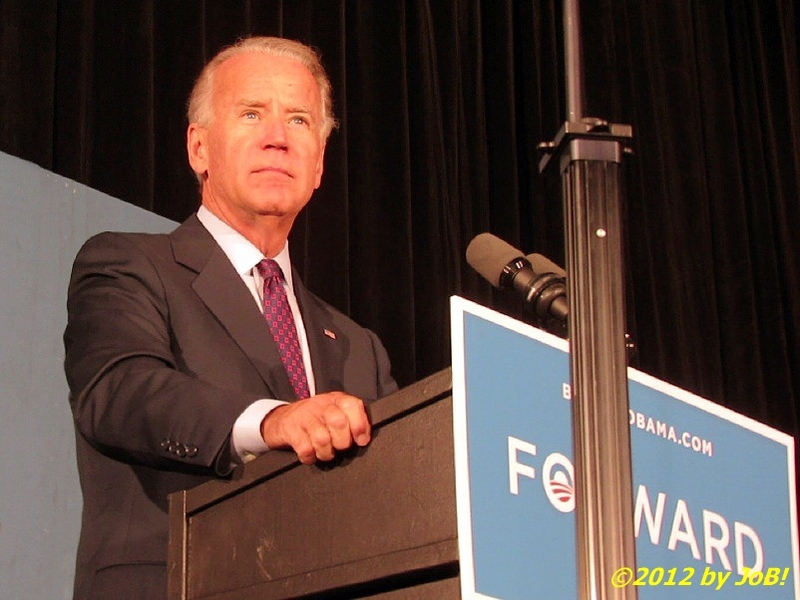 Biden moved on to the national debt and reminded the audience of the situation he and the president faced when taking office in January 2009 as well as a plan submitted to reduce that figure by $4 trillion over a 10-year period through a balance of spending cuts and increases in revenues. The vice president voiced opposition to proposed cuts in Medicaid, Social Security, and education benefits that would directly affect support to a wide spectrum of the population. "Two trillion dollars goes a long way to meet these basic needs," Biden said in reference to the amount of taxes that the Bush cuts exempts from the US Treasury for families and individuals making over $1 million per year--a group he referred to as the "privileged class." He also touched upon the administration's support for gender equality by sharing his personal vision of the future "where my granddaughters have the exact same rights and opportunities in every single respect as my grandson does--every single one." 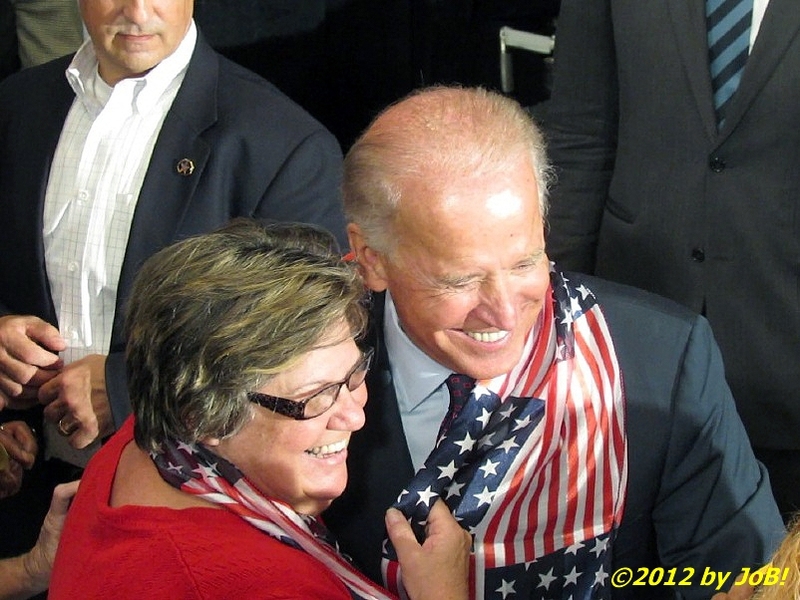 A supporter wraps a patriotic scarf around Vice President Biden after delivering his remarks at the "Grassroots Event" held at Wright State University on Wednesday afternoon. The vice president received rousing applause when mentioning the administration's support for the country's military forces, a group that comprises about one percent of the overall population and currently has 90,000 of its personnel deployed to Afghanistan. With regards to the nearly 6,500 killed and 50,000 wounded in the prolonged engagements, Biden said that "we must never, never forget their sacrifice and always keep them in our care and in our prayers". In the conclusion of his remarks, he mentioned that "there is no quit in America", a direct response to critiques made by the Romney ticket about the country's current problems and then offered them some advice: "Gentlemen it's never a good bet to bet against the American people!" 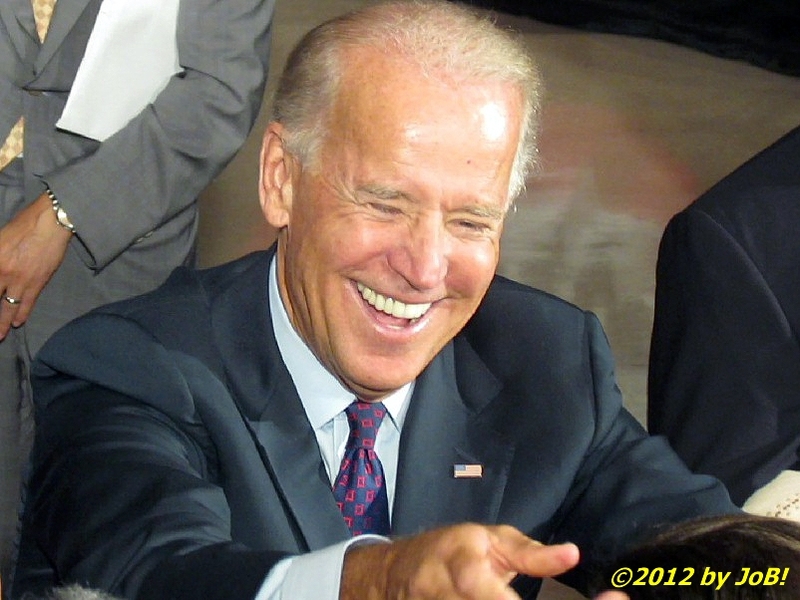 After his 30-minute speech, Biden greeted several supporters and posed for photographs. 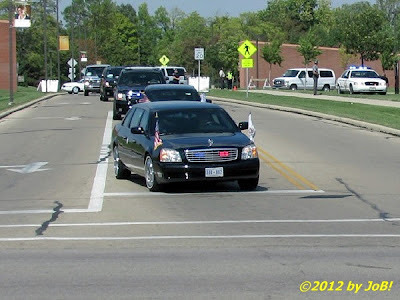 The vice president returned via motorcade to the local military installation and his awaiting aircraft that departed for Washington, DC at approximately 2:30PM. 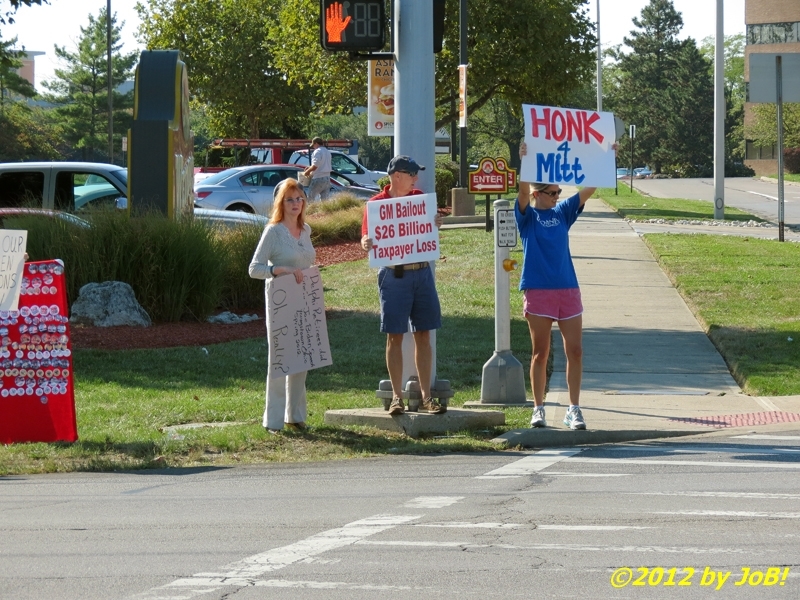 Protesters soliciting support of passing traffic across from Wright State University prior to Vice President Biden's appearance at the "Grassroots Event" on Wednesday afternoon. Although reduced in number by population shifts reflected in the 2010 Census, Ohio's 18 electoral votes are being strongly contested by both campaigns in the run-up to the November election. All four candidates have made multiple appearances in the "Buckeye State" over the past several months and the state's media markets have been saturated with political advertisements to help secure the support of any undecided voters. Paul Ryan, the Republican vice-presidential candidate, also made a campaign appearance in Owensville on Wednesday and President Obama will make stops in Cincinnati and Columbus on Monday. Vice President Biden's limousine leaves the Wright State University campus after the "Grassroots Event" on Wednesday afternoon. Wright State University has played host to several significant political events over the past two presidential elections. The school's Ervin J. Nutter Center, a multi-purpose arena, was the site of a major Obama rally during the run-up to Ohio's Democratic primary in February 2008 and served as the venue for Senator John McCain's introduction of former Alaskan governor Sarah Palin as his vice-presidential pick in August. 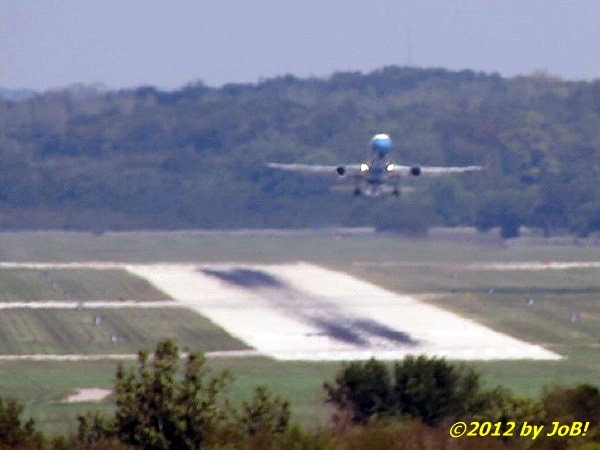 Air Force Two departs Wright-Patterson Air Force Base for Washington, DC after Vice President Biden's "Grassroots Event" at Wright State University on Wednesday afternoon.